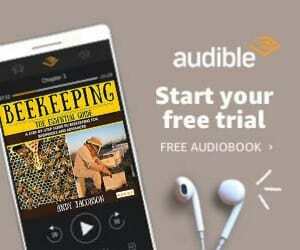 Beekeeping has skyrocketed in the US, from just a few thousand to now over 120,000 full and part-time beekeepers located all around the United States, from Northern parts through to the Southern States. This huge spike in interest for beekeeping, may well be due to the mindset shift that began to take place, starting in the early 200o’s, with individuals being more aware of current environmental issues, and the impact these issues have on our current and future life. Subsequently, the announced decline in bees, for reasons such as an increase in bee diseases, bee-killing pesticides, industrial practices, climate change and more factors [GreenPeace, 2013]. 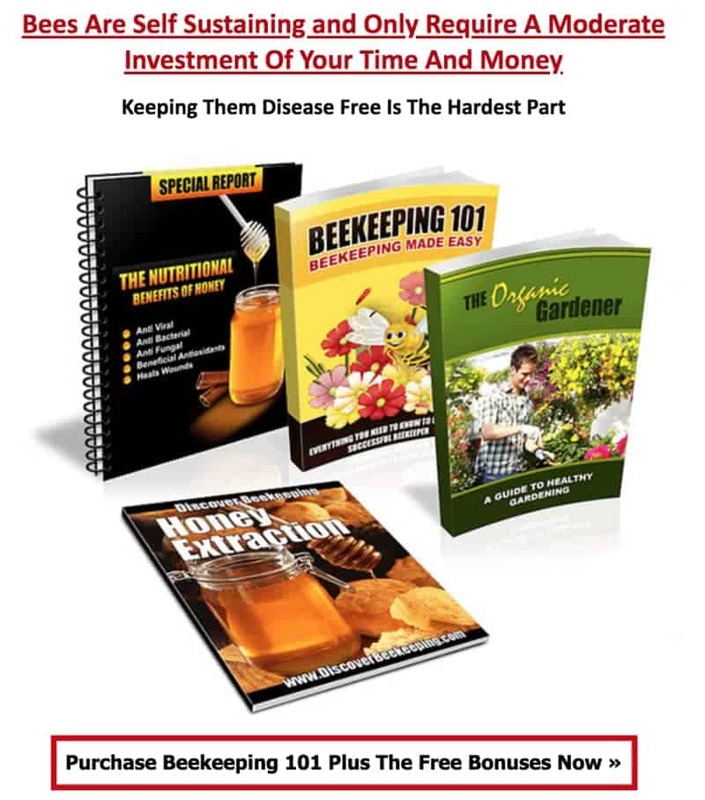 Ultimately, this has caused more everyday people to take action, and thus the statistics show that more people are learning how to start beekeeping, and are getting educated from website’s such as ours, on how to begin urban beekeeping . This rise in popularity, for both recreational and business-related beekeeping/honey production, has driven innovation in the beekeeping equipment industry. There have never been so many commercially available honey extractors for sale as there are now. In fact, commercial honey extractors are now more affordable than ever, the reason for this is likely because due to the increase in popularity acting as a catalyst for further development & technical innovation, for brands to try to maintain a competitive advantage over new market entrants. Whether you’re an amateur or a professional beekeeper, you should be aware of the great equipment innovations available today. 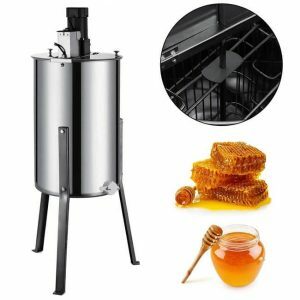 Therefore, to help you narrow down on exactly what kind of honey extractor would suit your requirements, we thought that it would be important to briefly talk about the basics below. 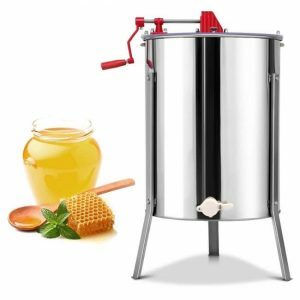 Why a Honey Extractor is important to have? The appliance itself, aids the process of getting honey from a beehive frame. It works by utilizing the fundamental scientific process of centrifugal force, to help draw the honey out from the honey combs, capturing it within the tank/reservoir for it to then be extracted via the in-built tap. Instead of producing honey slowly, and by hand, honey extractors have made the process more efficient than ever. 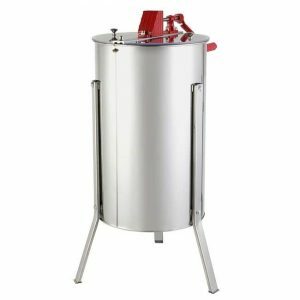 Almost every honey extractor is made from stainless steel, since it’s resilient and able to be cleaned easily, which is important as honey is particularly viscous. Extracting honey safely without causing damage to the hive is the main reason to use a honey extractor. A honey extractor will ensure that you keep the comb intact and undamaged at the end of the harvest. When you use a honey extractor, you can extract honey really fast and with ease. The extractor ensures that you use the right effort when uncapping the combs to produce clean and clear honey. We don’t recommend using a wooden honey extractor. Even though the wooden one will save you money, it can affect the process of harvesting honey and the quality of honey produced. Inside the drum, a tap is outfitted to allow honey flow from the extractor. For a smooth harvest, make sure you remove the honey right after extraction. You don’t want to leave the honey in the drums longer than necessary because it’ll affect the way the extractor spins. Let’s take a look at the different types of honey extractors for sale, so you can determine which one will best suit your needs. 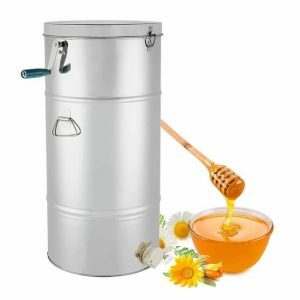 There are several types of honey extractor which you can choose from, all of which serve the same primary purpose, but each have different features which may be more suitable for some but not others. These two types of honey extractors are fairly easy to describe, without having to include any diagrams… But we’ll come to that later! 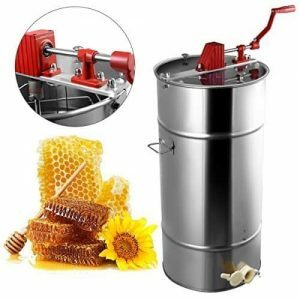 Manual honey extractors are ones that are operated entirely without electricity, using only human force… This means that you have to use the hand crank to spin the internal frames. As for the amount of frames that a manual extractor can handle, it’s around 2-4 on average. The process of releasing honey from the honeycombs usually takes around 10-15 minutes, depending on the speed to which you’re spinning the frames at. The main benefit with using a manual extractor is that you aren’t limited to operating the device near a plug socket. As you might have guessed, an electric honey extractor requires a power supply to operate; And hence works in a semi-automated way, with the frames having to be manually loaded into the extractor, and the power manually turned on/off. Otherwise, the process is mostly automatic. Electric honey extractors are usually more expensive, but the main benefit of using one over a manual extractor is that you don’t have to do the manual work. This is the more ideal solution, particularly for a commercial honey extraction setup, where several extractors are required to be run at once. However, if you’re considering an electric extractor unit, be sure that it has a variable speed motor. This will allow for you to start the extraction process with a slow rotation speed, gradually building up as the honey is extracted and the frames weigh less… Ultimately, it will ensure that excessive force/pressure is not placed on the frames when they are full of honey, after-all, we want to look after our beekeeping equipment right? Additionally to electric and manual honey extractors, there are also differences in the internal mechanisms, which more specifically relate to the way in which bee frames are placed and positioned within the unit, referring to Tangential and Radial. A tangential honey extractor has one side of the frame facing outwards; And therefore the frame has to be flipped once honey has been emptied from one side, to repeat the process. Additionally, this can become a particularly monotonous task if you’re using a manual honey extractor. Alternatively, a Radial extractor has frames which are placed perpendicularly to the outside wall of the extractor, which is a much more efficient way of extracting the honey, as the force of the rotation pulls the liquid from multiple angles. Therefore, with this information being fresh in your mind, it should be relatively easy to see which kind of extractor is ideal for you. With large commercial beekeeping companies likely being tempted by the electric, radial honey extractors, and more low-budget, part-time beekeepers being swayed by the manual honey extractors. 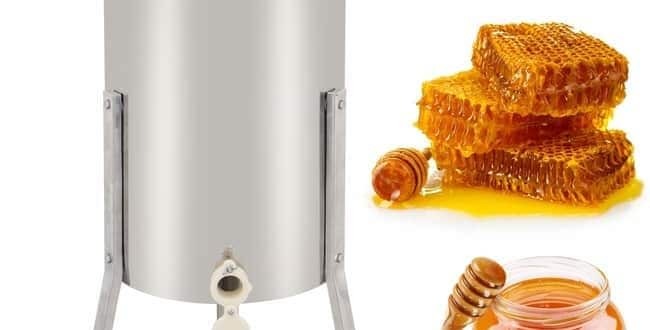 Anyway, with that being said, we’ve featured a list of our favourite honey extractors for sale that are available in 2019, all of which have been arranged into either of two categories Electric Honey Extractors & Manual Honey Extractors, in price ascending order. Frame sizes – Handles deep, medium and shallow frames. Clear plastic lids – Reduce debris during process and view extraction, which also allows you to watch the extraction process in action. 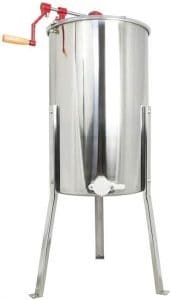 The Super Deal Pro is the most affordable honey extraction unit featured in our list, being priced way under $100. It’s capable of holding up to 2 frames during operation, and has a clear plastic lid so that you can easily inspect the frames whilst in the honey harvesting process. The unit has a conical bottom (cone shaped), extremely well-built and is ideal for deep frames. 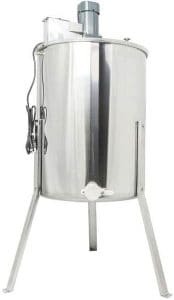 Although this item only has a few ratings, it has some incredibly positive reviews, and would be a perfect extractor unit for someone who doesn’t want to spend a large sum of money, potentially ideal for a beginner or hobbyist beekeeper. Taking into account its price, and the review ratings it has, we have to give the Super Deal Pro a 4 out of 5 star rating. 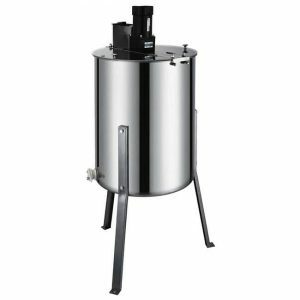 The Zeny Pro 2 is a close second in being a highly affordable honey extraction unit featured within the list. It’s incredibly similar to the former unit, featured previously to this one, having the same physical appearance and being capable of holding up to 2 frames during operation. It too has a double sided clear plastic lid, which makes for easy access and inspection of the frames during the harvesting process. The unit does accommodate for langstroth deep frames and has a cone-shaped bottom, useful for collecting the honey, and the honey tap is sturdy but easy to use. Additionally, the mechanism of this unit feels very smooth and effortless, with the metal hand crank being effective, although you may want to tighten the front cover of the gear box, which is easy to do. The downsides of this unit are that there are some rough edges, so be careful, although this shouldn’t be a problem if you’re able to easily smooth them out, especially considering the price; However, if you’re not necessarily someone experienced with any kind of DIY and being able to smooth out those few rough edges, it may not be for you. Taking into account its price, and the review ratings it has, we have to give the Zeny Pro a 3.7 out of 5 star rating. The Happybuy manual honey extractor has the capacity to hold up to 2-frames (deep frames). Similarly to units that we’ve previously talked about, this also has 2 clear plastic lids, which make it perfect for viewing the internal extraction process. Additionally, the unit also has two handles on either side to make it a little easier to put into position. We advise that you initially fill it with water, to check that there aren’t any leaks, as one or two reviews suggested that they had a leak. Additionally, make sure that the company have provided enough screws, as this was also a complaint that we saw was shared. However, considering the price, and the average review rating of this unit, there is a very minimal risk. Taking into account its price, and the review ratings it has, we have to give the Happybuy 2-fram extractor unit a 3.9 out of 5 star rating. The GoPlus manual honey extractor has the capacity to hold up to 2-frames, from shallow, medium through to deep frames, making it very versatile. The unit itself is a tangential honey extractor, and therefore the frames fit with one side facing the center, and one side facing the wall of the unit. We think that this unit could hold approximately 4-5 gallons of honey, with the centrifuge cage being quite large in size. As far as we’re aware, there is not a commercial stand available for this unit, but we’re fully aware of the ingenuity of our readers and the beekeeping community, so we have faith that you can come up with your own solution. Additionally, the mechanism is solidly built with he cranks working incredibly smoothly, allowing the basket to be spun particularly well! Taking into account its price, and the review ratings it has, we have to give the Zeny Pro a 4.2 out of 5 star rating. 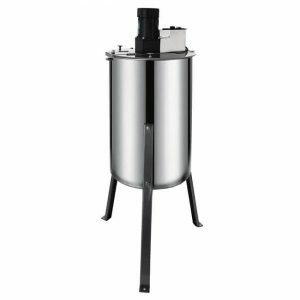 The Vivo BEE-V002C is a two-frame capacity honey extraction unit, which is versatile in use, being able to hold any kind of frame type, from shallow, medium through to deep frames, with a maximum frame height of 10-inch. According to reviews, the unit is extremely easy to assemble, with clear instructions being included within the box it arrives in. Additionally, it’s also very straightforward to clean. It must be noted that you will need to check the overall tightness of some of the screws, as they may have loosened during being transported. This is very important to make sure that the structural integrity of the unit is intact, as the last thing you want is for it to break apart whilst under the duress of the honey extraction process, with honey spilling everywhere. Taking everything into account, this is an exceptional unit, which is why its Amazon review ratings are so positive. Taking into account its price, and the review ratings it has, we have to give the Vivo BEE-V002C a 4.4 out of 5 star rating. The GoPlus honey harvesting unit is a two-frame extractor, able to hold shallow, medium and deep frames. Similarly to other units, the handle of the GoPlus extractor contains a spring clutch, meaning that it can crank the gears, and will not spin once released. A potential downside of this unit is the fact that it does not arrive with instructions, and some reviews have suggested that there were missing parts (small screws). However, other reviews have noted that it’s a great unit for the price. Although we think that it’s not a bad choice for a manual honey extractor, we think that there are much better alternatives, which are cheaper! Such as the previous GoPlus unit that we talked about! Taking into account its price, and the review ratings it has, we have to give the GoPlus unit a 3.5 out of 5 star rating. The Happybuy honey extractor is able to hold 3-frames at once, versatile enough to hold shallow, medium and deep frames. The metal gears are enclosed to make sure that they are kept clean and free from any honey residue during operation, making for easy cleaning. This unit has a plastic, see-through lid, making for easy viewing whilst the extraction process is underway. Additionally, the bottom of the centrifuge cylinder is cone-shaped, which makes it ideal for collecting honey for efficient extraction with its plastic tap. We advise that you initially fill it with water, to check that there aren’t any leaks, as one or two reviews suggested that the unit had a tiny leak. However, considering the price and the current average review rating of this unit, the chances of this are incredibly small. 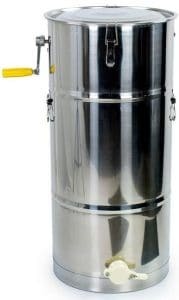 We have to give the Happybuy 3-frame manual honey extractor unit a 4.0 out of 5 star rating. 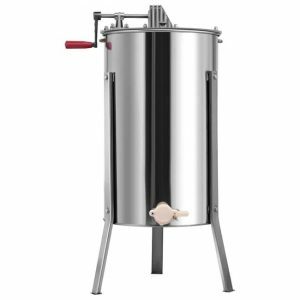 The Vivo BEE-V002 is a two-frame capacity honey extraction unit, which is versatile in use, being able to hold any kind of frame type, from shallow, medium through to deep frames, with a maximum frame height of 10-inch. The unit has 2 handles on each side, so that it’s easily transported. Additionally, the metal gears are enclosed to make sure that they are kept clean and free from any honey residue during operation, making for easy cleaning. Overall, the unit has a great build-quality, and the mechanics of the crank are smooth which makes for a very efficient spinning of the basket. Two aspects that we particularly like about the Vivo Bee-V00() series is the fact that the feet can be bolted to a surface of your choosing, meaning that you don’t have to worry about it falling over during operation, and additionally, as with all Vivo products, it comes with a 1-year manufacturers warranty, which is a fantastic. Taking into account its price, and the review ratings it has, we have to give the Vivo BEE-V002 a 4.6 out of 5 star rating. The Vivo BEE-V003D is very similar to the previous (V002) product, with near to exactly the same overall measurements, but the difference being that the V003D unit is capable of holding 3 frames, from shallow, medium through to deep frames, with a maximum frame height of 10-inch. Overall, the unit has a great build-quality, and the mechanics of the crank are smooth which makes for a very efficient spinning of the basket.Two aspects that we particularly like about the Vivo Bee-V00() series is the fact that the feet can be bolted to a surface of your choosing, meaning that you don’t have to worry about it falling over during operation, and additionally, as with all Vivo products, it comes with a 1-year manufacturers warranty, which is a fantastic. Taking into account its price, and the review ratings it has, we have to give the Vivo BEE-V003D a 4.6 out of 5 star rating. The GoPlus honey harvesting unit is a four-eight frame extractor, able to hold shallow, medium and deep frames… Although its unspecified as to exactly what this means, with it being more common that this size of honey extractor is able to hold 4 large frames or 8 small/medium sized frames. This unit is the more premium-priced manual honey extractor by GoPlus, and from our research, we think that the Vivo V004B (discussed directly below) is a better option if you’re looking for an extractor which is capable of harvesting up to 8 frames simultaneously. Taking into account its price, and the review ratings it has, we have to give the GoPlus unit a 4.15 out of 5 star rating. The Vivo BEE-V004B is very similar in height to both the V003D and the V002, but differs in its diameter being substantially wider, at 18.5″. This provides the capability to hold anywhere from 4-8 frames, depending on the size, being able to handle 8 small/medium frames or 4 large frames during the extraction process… Although you need to be mindful that too much weight can put strain on the crank mechanism. This manual honey extractor unit has a clear, plexiglas lid, so that you can easily observe the frames during the harvesting process. Simiarly to other Vivo extractors, according to reviews, the unit is extremely easy to assemble, with clear instructions being included within the box it arrives in. Additionally, it’s also very straightforward to clean. Overall, the unit has a great build-quality, and the mechanics of the crank are smooth which makes for a very efficient spinning of the basket. Two aspects that we particularly like about the Vivo Bee-V00() series is the fact that the feet can be bolted to a surface of your choosing, meaning that you don’t have to worry about it falling over during operation, and additionally, as with all Vivo products, it comes with a 1-year manufacturers warranty, which is a fantastic. We think that this is perfect for the beekeeper who is looking for a highly versatile extractor, capable of processing up to 8 frames simultaneously. Taking into account its price, and the review ratings it has, we have to give the Vivo BEE-V004B a 4.8 out of 5 star rating. 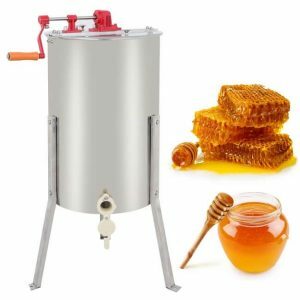 The Happybuy 2-frame electric honey extractor is the most affordable electrically powered extractor featured on our list. The unit itself is made from food-grade stainless steel, and is an anti-corrosion & anti-rust material, making it suitable for water cleaning. The honey extractor has a fully-enclosed transmission box, which means that the internal mechanisms won’t get honey residue sticking to it. As for the electrical motor, one of the biggest criticisms of the unit is the fact that some say that it is underpowered, with the motor not being able to spin the basket (particularly when full of honey) at a large enough RPM. Eventually, the honey will drain from the honeycombs, and the extraction process will be complete… However, if this is your price-point, a manual extractor may be quicker to operate, despite it taking manual effort on your part to complete. We have to give the Happybuy 2-frame electric honey harvesting unit a .3.5 out of 5 star rating. 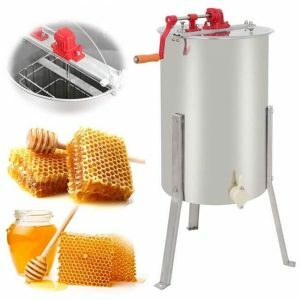 The Happybuy 3-frame electric honey extractor is extremely similar in respects to its physical characteristics to the 2-frame version, and is made from food-grade stainless steel, and is an anti-corrosion & anti-rust material, making it suitable for water cleaning. One of the largest criticisms of the unit is that it requires some level of weight of being fastened to the ground whilst being operated, as it can move. As for the electrical motor, one of the biggest criticisms of the unit is the fact that some say that it is underpowered, with the motor not being able to spin the basket (particularly when full of honey) at a large enough RPM. Eventually, the honey will drain, and the extraction process will be complete. However, other reviews suggest that the unit works perfectly, so we advise that if you so choose to purchase it, look out for these potential weaknesses. Alternatively, if you’re set on getting an electric honey extractor, why not take a look at the Honey Keeper (4-frame) & Vivo BEE-V004E (4 frame) extractors which we talk about further below. We have to give the Happybuy 3-frame electric honey harvesting unit a 3.5 out of 5 star rating. 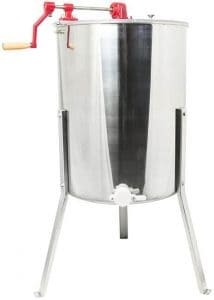 The Happybuy 4-frame electric honey extractor is extremely similar in respects to its physical characteristics to the 3 and 2-frame version, but has a much larger diameter of 20″, as opposed to the 15″. 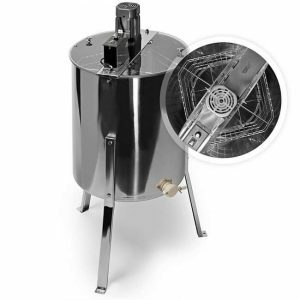 The 4-frame version is made from food-grade stainless steel, and is an anti-corrosion & anti-rust material, making it suitable for water cleaning. We have to give the Happybuy 4-frame electric honey harvesting unit a 3.8 out of 5 star rating. The Honey Keeper Pro 4-Frame is an electric honey extractor capable of holding up to 8 frames for simultaneous honey extraction. Although its unspecified as to exactly what this means, with it being more common that this size of honey extractor is able to hold 4 large frames or 8 small/medium sized frames. As with all of the electric honey harvesting units, you want to make sure that you start the process at a slow speed, and then increase it gradually as more honey has been excreted from the combs… This is to ensure that the motor doesn’t blowout. Similarly to the last unit we talked about, the unit is also a tangential extractor, which means that you’ll have to open it up, and turn the frames around half way through the extraction process. The clear plastic, lids make it easy to observe how the process is going. We think that this is a great unit for those who wish to be able to harvest from up to 8 (small) frames simultaneously.. However, one drawback against the similarly priced Vivo unit, is that Honey Keeper do not mention any warranty period… Unlike Vivo who provide a 1-year manufacturers warranty. 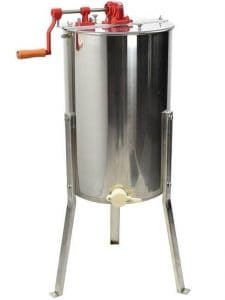 Taking everything into account, this is a great, versatile unit, capable of streamlining your honey extraction process. Taking into account its price, and the review ratings it has, we have to give the HoneyKeeper Pro a 4.5 out of 5 star rating. The Vivo BEE-V004E is an electric honey extractor capable of holding up to 4 frames for simultaneous honey extraction. The unit itself has a 120v AC Motor, which runs almost effortlessly as it has an in-built cooling fan to prevent overheating, just take a look at the customer reviews if you don’t believe us. Additionally, the unit is a tangential extractor, which means that you’ll have to open it up, and turn the frames around halfway through the extraction process. The plastic, see-through lids make it easy to observe how the harvesting process is going, without introducing any impurities into the process. The polished exterior won’t corrode or rust, allowing your honey to be food-grade while not compromising quality or style in your unit. The transmission is enclosed to make sure that they are kept clean and free from any honey residue during operation, making for easy cleaning. Overall, the unit has great build quality. Two aspects that we particularly like about the Vivo Bee-V00() series is the fact that the feet can be bolted to a surface of your choosing, meaning that you don’t have to worry about it falling over during operation, and additionally, as with all Vivo products, it comes with a 1-year manufacturers warranty, which is a fantastic. Taking into account its price, and the review ratings it has, we have to give the Vivo BEE-V004E a 4.8 out of 5 star rating. It’s clear that everyone has different requirements from a honey extraction unit, as everyone reading this will be at different skill levels, require either an electric of manual honey extractor, with different amounts of frames to be harvested simultaneously. Additionally, there will be certain aesthetic features which appeal to some, that simply don’t to others… So it’s incredibly hard to conclusively state which one’s best. However, we’ve featured 2 editor’s recommendations within the article, one for the recommended electric honey extractor, and one for the manual honey extractor. In conclusion, we hope that this article has been helpful in informing you on the best honey extractors to buy, we advise that you take a further read of each extractor’s customer reviews, which we’ve linked to.